Dispatch from the Secret Season, Week 3: Looking like a war zone. « Welcome to the Riley Sheahan Wing of the Hockey Hall of Shame. Part 4 in a series. Read parts 1, 2 and 3. DATELINE UNKNOWN – Well, it’s been interesting here. We’ve had a full-scale brawl between the Bruins and Canadiens, Todd Bertuzzi whimper like a dog when an electric fence knocked him unconscious, Drew Doughty sipping beers on the bench, five pudgy agents flatten Shane Doan WWF-style, Henrik Lundqvist customize three buses into “Pimpmobiles,” and Ryan Suter join Zach Parise in the penalty box … even though Suter was never penalized. Hard to believe, but it’s all happened through two weeks of our Secret Season. And you’ll never believe what happened this week: A missile nearly struck our village. So you’re probably wondering who sent the missile toward our village, right? 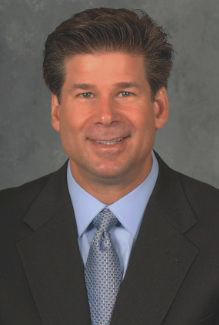 We called Stanley Cup trustee Brian O’Neill for his take. His voice quivered throughout the conversation anytime we mentioned “Gary Bettman” as a possibility. At first, we reckoned O’Neill for a doctor; then we thought he was a flat-out sissy; then we sympathized and realized there is clear and present danger here. We took his word for it and the Cup celebration never happened. But what about this missile? “He can hear us,” O’Neill says. What? He can hear us? And the phone line died. Breakdown: Henrik Lundqvist might be able to design the inside of a bus with La-Z-Boy recliners, plasma screens, refrigerators and saunas, but he ain’t no mechanic. Until that happens, the Rangers might have issues. Yes, the 25 players can cram into two buses. But it’s disrupted team chemistry. Lundqvist’s luxury items are great, but now everyone is spoiled. Each player wants a La-Z-Boy recliner and there’s not enough to accommodate everyone. That means some players have to stand, which can be a dicey situation. No Gaborik, no chemistry, no victory Wednesday against Pittsburgh. And no victory Friday against Ottawa (more on that later). As for the rest of the division, a three-win week pushed Pittsburgh ahead of New Jersey in the standings. Hey, you can say what you want about Sidney Crosby’s whining, but the kid can play hockey. He single-handedly carried the Pens on Wednesday and Friday. Someone had to pick up the slack for James Neal, who missed both games. Amazingly, he missed the team bus both days because he was too busy styling his hair. We’re not kidding. Bus driver Matt Cooke doesn’t have much patience, and left the parking lot without him both days. That’s the beauty of this Secret League: These guys still hold each other accountable. Player of the week: Scott Hartnell is on a furious rampage. He scored 10 goals this week as the Flyers kept the heat on the arch-rival Penguins. At first, we thought Hartnell was upset after a slow start to the season and a team-wide meltdown against the Pens last week. But, no, he’s actually pissed that he cannot reside in his multi-million-dollar house in Philadelphia. Hey, if you had arcade games in your “pad,” and could no longer use them, you would be ticked too. Noteworthy: Rick DiPietro’s soap-opera watching last week created a heated locker room. Trevor Gillies took a swing at DiPietro’s eye and created an ugly goose egg. Captain Mark Streit had no choice but to inflict a two-week suspension to Gillies and a three-game suspension to DiPietro for insubordination. The problem is: Gillies and DiPietro are roommates and there’s nowhere to hide in the village. This cannot be good for DiPietro. Breakdown: Phil Kessel needs to grow up. There were rumors swirling that he was “jealous” of James van Riemsdyk’s scorching production, and by golly, they were true. Kessel locked Van Riemsdyk in the arena locker room prior to Monday’s game against Buffalo. It made us wonder how Kessel was able to lock somebody INSIDE a locker room; we found out it’s possible at this recreational rink. It has old-school bolted doors from the 1960s. Kessel, being the wily cat he is, stole the key from the front desk and managed to hide Van Riemsdyk. Of course, it backfired and Buffalo rolled 5-0. The big scare happened when Kessel went to “return the key” to the desk. Sure enough, there was an arena worker, strolling into work with half-shut eyes and a morning coffee. Phaneuf witnessed the scene from a distance, hid behind a garbage can, ordered the Leafs to “take cover!” and waited for the right moment to board the bus. Kessel, meanwhile, dove into the women’s restroom to avoid the sighting. On the 25-minute ride back to the village, Phaneuf charged Kessel and smashed his head against the window, which caused driver Joffrey Lupul to swerve the bus into a guard rail and flatten a tire. Thankfully, there was a spare tire in the back and 25 strong men to act like a jack and lift the bus high enough to make the tire change. The Leafs are thinking about benching Kessel for an entire week because of his actions. Stay tuned. Kessel is never good with receiving instruction. Worst Player of the week: Carey Price has yet to warm up to the idea of playing hockey in the Secret League. He’s started every game and is the sole reason behind the Canadiens’ 1-6-2 start. He was the lone bystander during the infamous Bruins-Habs brawl. He simply didn’t care that his teammates were in the midst of the biggest pounding of their life. Now the Habs leave opponents wide open in the slot and allow Price to get whacked repeatedly by sticks. They have abandoned him entirely. Something needs to be done to buck the trend. Something from Price. Noteworthy: It’s never good for an opponent when Chris Neil holds a grudge. He’s been talking a “rematch” with the N.Y. Rangers for the past two weeks. Remember Neil’s series against New York last spring? He scored the overtime winner in Game 2 and nearly decapitated Brian Boyle in Game 5. Neil still hasn’t recovered from blowing a 3-2 series lead and losing Game 7 in Madison Square Garden. We got a sense of his rage when he threatened the construction workers and officially secured our village. Remember: He made extra-special sure they wouldn’t leak our Secret League to the public. Well, if that was rage, you should’ve seen him Friday against the Rangers. Neil charged after Marian Gaborik on the game’s first shift like a bull in Pamplona: head down, eyes red, nostrils and earlobes steaming. Problem is, Gaborik eluded the oncoming charge. Neil ran over Daniel Alfredsson instead. The impact was so hard, Alfredsson flew through the glass like the Swedish hockey player you see on those bloopers. This isn’t good. Alfredsson was absorbing this Secret League like it was his last NHL season. He’s 39 years old, remember. And there’s no guarantee he would play in 2013-14. Let’s hope he can return in a hurry. Breakdown: The division is finally coming to life – except for the Washington Capitals, who are still missing Alexander Ovechkin. They lost three games this week without him. One reason they were distraught was a massive interrogation by our Secret League officials. We barged into Ovechkin’s room and found 12 Russian Stoli bottles and a heap of pizza boxes in the corner, yet there was no trace of him. We think Mike Green is hiding him somewhere in his village room. But we don’t know where. Last week, all the ugly scoreless ties caused a referee to fall asleep and get checked by Dustin Byfuglien. This week, Byfuglien took out another ref, channeling Henrik Zetterberg’s hit on Nikita Nikitin. We’re getting suspicious. Byfuglien swears he’s innocent, but he looks like the Secret League version of Ndamukong Suh. Worst player of the week: Sometimes Vincent Lecavalier needs a tiff with a coach to break out of a slump. Think about his disputes with John Tortorella. Lecavalier has been in the positive column of the plus-minus stat just twice in 13 NHL seasons. Those two seasons were under Tortorella. Here in the Secret League, without a coach breathing down his neck, Lecavalier is lazy and virtually useless. He’s an unfathomable minus-35 through nine games and has killed the production of Martin St. Louis, who has yet to record a point in nine games. Noteworthy: Winnipeg’s Blake Wheeler called Ryan Suter a “woman” during their game this week. Suter thought it was a direct insult, a direct comment on his close bonding with Zach Parise, but he shouldn’t be offended. Wheeler is notorious for confusing genders. Marian Hossa, our default commissioner for luring everyone to this Secret League, is really frustrated with his 2-7 ‘Hawks. He believes he should have the power to make a trade. Sorry, but that’s not in our bylaws. We gave Hossa the crown of commissioner for convincing everyone to be traitors, but that doesn’t mean he can gain dictator-like power and start trading himself willy-nilly. If we did, that prima donna will have worn 32 jerseys by Christmas. Hey, if you’re not happy with the Hawks, then you’ll never be happy. It will get better when Patrick Kane gets back from his pulled-back-muscle-from-lifting-hockey-bag injury. And you have to help yourself, Marian. You cannot tell Jonathan Toews that he’s a spitting image of James Franco. That’s just gonna piss him off. Listen, Marian: Keep your emotions in check, shut your mouth, respect your own badge as league commissioner. Meanwhile, Nashville is really making a statement atop the division standings. It helps that opponents do not come within a 10-foot radius of Shea Weber. Last week, Weber delivered a sucker punch to Winnipeg’s Blake Wheeler, a spear to Jarome Iginla and a facial-cross-check to T.J. Oshie. Weber takes full advantage of our no-suspension system, and nobody was risking injury this week. It’s quite an advantage when everyone clears out of the way of a Weber slap shot (four goals) and allows him to skate freely through the neutral zone (three assists). Heck, when Detroit’s Henrik Zetterberg dumped in the puck this week, he slammed on the breaks at the hash marks and watched Weber scoop the puck in the corner and lead a breakout. I guess we cannot blame Zetterberg after last year’s playoffs. But what about Dallas’s Brenden Morrow, who had a one-on-one with Weber from the red line, to the blue line, then … just abandoned the puck and sprinted to the bench. Player of the week: Ryan Callahan, who scored five goals in Wednesday’s victory against St. Louis, then scored twice against Washington on Friday. We’re not sure if he’s angered, or if opponents are scared. The “Hannibal-Lecter-like mask” he wears is quite uncomfortable – and quite scary if you’re an opponent. Remember: Callahan nearly unveiled our secret location three times. We warned him: Another near-slippage and you’re getting a muzzle. He didn’t listen and we were forced to make him wear the mask. Hey, at least we cared enough to buy the actual mask worn by Anthony Hopkins in “The Silence of the Lambs.” Callahan, however, scoffed in the face of our Secret League officials. Ingrate. We understand he’s pissed about being traded from the Cup-worthy New York Rangers. We understand Columbus doesn’t care about hockey unless there’s a ceremonial puck drop by the Ohio State Buckeyes, which means Callahan’s career is officially on the downward spiral. But there’s no reason to take that out on us. And that’s no reason to try and ruin our Secret Location and give Bettman a launching pad for more missiles. Callahan needs to look past his own nose for once in his life. That will be difficult now that it’s covered in plastic. Noteworthy: Pavel Datsyuk’s spinning puck and pinball-like goal raised suspicions about his humanity. We submitted a search warrant; it was written in English so he couldn’t read most of the jargon. We busted into his room and found nothing to prove he was inhuman. One of our agents snuck in through the door wall on the second level – through the help of a forklift. Remember, our Secret League Intelligence agents are the height of jockeys and weight of sumo wrestlers, not a good combination when trying to enter through a 4-by-7 door. None of them could fit. So we got the forklift, raised him up there (two agents would’ve been impossible to lift; there’s a 900-pound weight limit), and – voila! – we were inside. Our next step is to administer Datsyuk a blood test, but it might take a while. We can’t just go around pricking veins. Breakdown: Roberto Luongo is a mess. It’s not his fault; Keith Ballard’s stick knocked him into another dimension and he’s not coming back. Then again, these things happen when you’re Luongo, who demanded a week one “pick-the-starting-goalie-out-of-a-hat charade,” hid inside the goal during a game, then laughed hysterically each time Cory Schneider allowed a goal. This week, Luongo walked over to the Winnipeg section of the village and demanded a trade for Ondrej Pavelec, Evander Kane and a first-round pick. Umm, one problem, Louie: There are no GMs here. You’re stuck in Vancouver (And stuck in the village; ask Todd Bertuzzi.) Either make it work, or don’t play. How bad can it be, you big baby? I suggest you kiss up to some teammates and make them wanna play you in net again. That said, Louie sat all week and the Canucks actually won two games. Of course, he didn’t support any of his teammates. He just wore that baseball cap, listened to his iPod and sulked. That’s not even the worst thing that happened this week. The worst: Edmonton’s Nail Yakupov was taped to a locker room bench by a trio of teammates – Taylor Hall, Jordan Eberle and Ryan Nugent-Hopkins. They considered it “rookie hazing.” They think they’re cool, now that they’re the equivalent of sophomores and juniors in high school and treat Yakupov like a freshman. Problem is, the youthful trio failed to think ahead. Out here, there are no team employees who could find Yakupov and unwind him from his “friction tape” nest. So he stayed there all night. And the next night. In fact, he was there from Monday at 4 a.m., until Wednesday at 3 a.m., when the Avalanche and Bruins arrived for a game and Paul Stastny found him starved, exhausted and dehydrated. Yakupov is now in the village infirmary eating food through a tube because of malnutrition. It’s not good when you burn 3,000 calories from a night of skating, then lay still for 48 hours without food and water to repair the body. We wish we could inflict a suspension on Eberle, Hall and Nugent-Hopkins, but there’s not much we can do. There’s no Secret League rules committee. But, you reap what you sow, and the Oilers lost two games without Yakupov. Serves them right. Player of the week: Jean-Sebastien Giguere. Goodness, gracious, he was brilliant this week. Two shutouts, three victories, .973 save percentage (stopped 71 of 73 shots). The 35-year old “Jiggy” portrays the form he flashed with the 2003 Anaheim Ducks, when he won the Conn Smythe Trophy despite losing in the Cup Finals. If we had video, seven of his saves would make the top 10 highlights of the week. Unfortunately, we don’t have the money to install state-of-the-art electronics. Noteworthy: The Zach Parise and Ryan Suter streak broke. We’ve chronicled their weird habits: They sit on the bus together, eat together, have adjacent lockers and take the same shifts. Parise, a forward, and Suter, a defenseman, played 177:08 together through two games this week. That’s where the streak broke. Here’s what happened: Parise was whistled for an icing penalty, which prompted Suter to scream at the linesman and demand a video review. Suter pointed to the spot where Parise dumped the puck into the corner. He grabbed a black marker and circled the spot behind the red line. He even got down on all four and pointed repeatedly to the “stick mark” on the ice. Suter’s actions got him tossed from the game. Parise tried to follow him out the door, but we intervened and forced him to play. We threatened Parise with a 10-game suspension if he left the ice in solely to pursue Suter. This is just a threat since we don’t have a rules committee, but maybe he’ll listen. We wish you could’ve seen Parise the rest of the game. Lifeless. No jump. Minus-4. Zero shots. Really, it’s quite pathetic that Suter is so important to him. If he continues to disrespect the integrity of our game, something bad is gonna happen. Breakdown: You can’t help but pull for a quality human being like Teemu Selanne. The 42-year old could’ve hung up the skates in frustration with the lockout, but instead, he received a text message from our Head Traitor/Commissioner Marian Hossa and decided to join the Secret League. On top of that, Selanne takes it upon himself to drive the team bus, cook team meals and be the elder statesman to a youthful group of Ducks. Did you know he taught kindergarten in his native Finland? It came into play last week when Ryan Getzlaf and Corey Perry were arguing over bunk beds. Selanne simply walked into the room, signaled “Shhhh,” drew straws, and Perry got the top bunk. Anyone else who tries this would be punched in the face, but not Selanne. In what could very well be his last rendezvous with ice and pucks, he’s making it all worthwhile. He scored five goals last week as the Ducks downed Dallas, Nashville and Phoenix. Player of the week: Joe Pavelski, who managed to score a hat trick despite suffering from a nasty cold caused by his own ignorance. You see, Pavelski left his equipment inside the team bus overnight. Well, you know what that means, right? The sweat froze. His ice-cold shin guards had him sneezing all game long – and he still beat Red Wings goalie Jimmy Howard three times. Noteworthy: Shane Doan is in serious but stable condition inside the village infirmary. Remember what happened last week: He was hypnotized to try and reverse his post-traumatic-referee-screwed-me disorder (PTRSMD). But it backfired and he took the ice with a two-piece stick and started to take it apart and dismantle the thing into pieces. It had a compartment with bullets and a 9mm gun. It looked like a scene from The Naked Gun, Doan playing the part of robot Reggie Jackson, and the head official – purely oblivious – playing the Queen of England. Thankfully, five members of our Secret Intelligence Agency went through the Zamboni entrance and tackled Doan. Remember: They’re the height of jockeys and weight of sumo wrestlers, so it wasn’t pretty to see Doan smothered by five pudgy agents. To make another Naked Gun reference, Doan looks like Vincent Ludwig’s body in the final scene: Flattened by a steamroller.